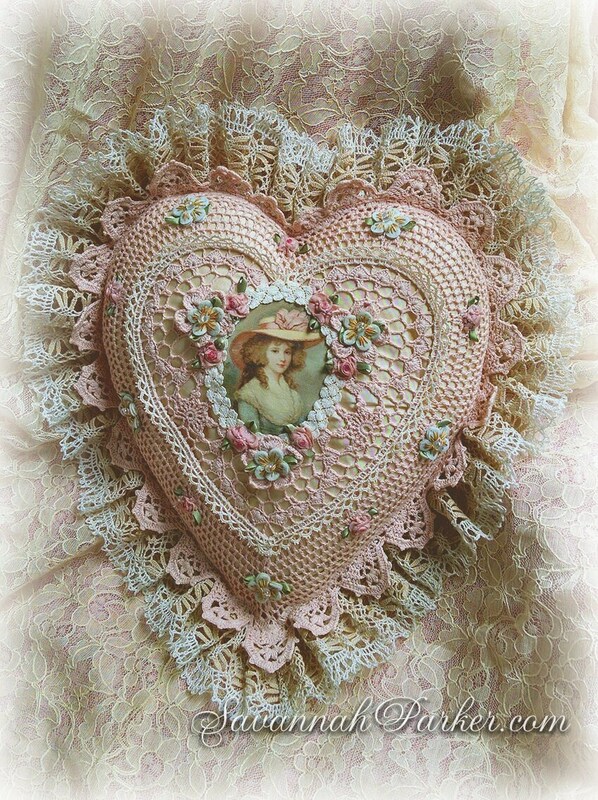 Antique Style Victorian Edwardian Shabby/Cottage Chic Romantic exquisite heart shaped blush pink hand crocheted, handmade pillow with separate envelope-style crochet cover and silk inner pillow.....part of my new line of fabulous antique-inspired, totally romantic shabby chic/cottage chic and Victorian style pillows....This one is lavished with handsewn antique and vintage laces and tons of gorgeous ribbonwork and embroidered felt flowers....so perfect in a Victorian or Edwardian room! 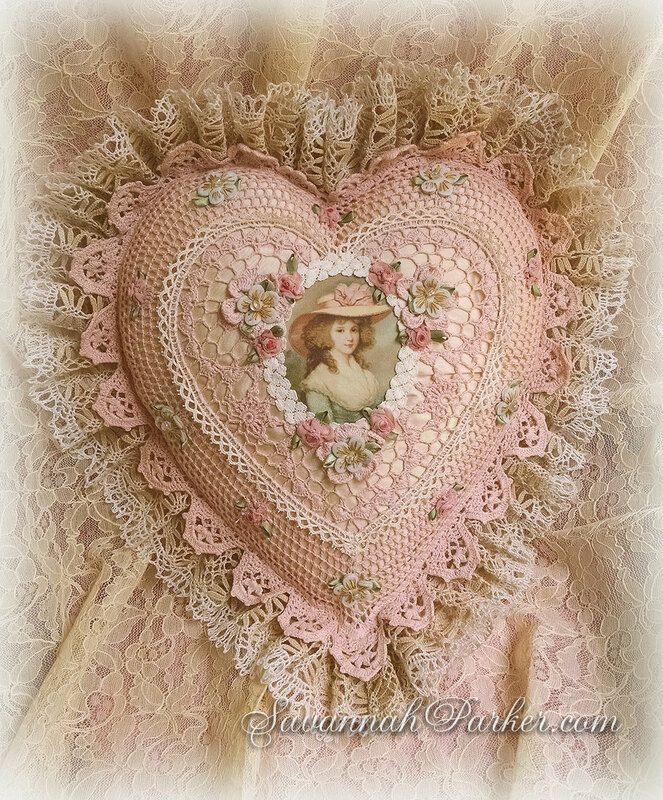 For many years I've looked at many of the "shabby chic" type pillows made from vintage materials, but never cared for the "shabby" part; am just not into the frayed and tattered look....! 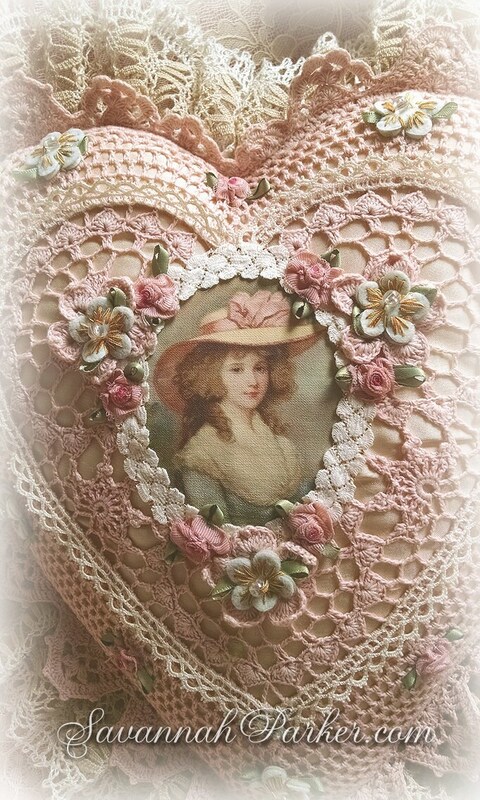 So I decided to design my own very antique-inspired pieces that incorporate some of the exquisite laces, trims & materials in my never ending stash, with more elegant & clean details....you won't find any raw edges or haphazardly tacked-on doilies/bits of random trim here, only the fabulous vintage elements and fine-couture quality finishing that is the standard for all my creations....This one has the loveliest shade of blush pink hand crochet over ivory silk! 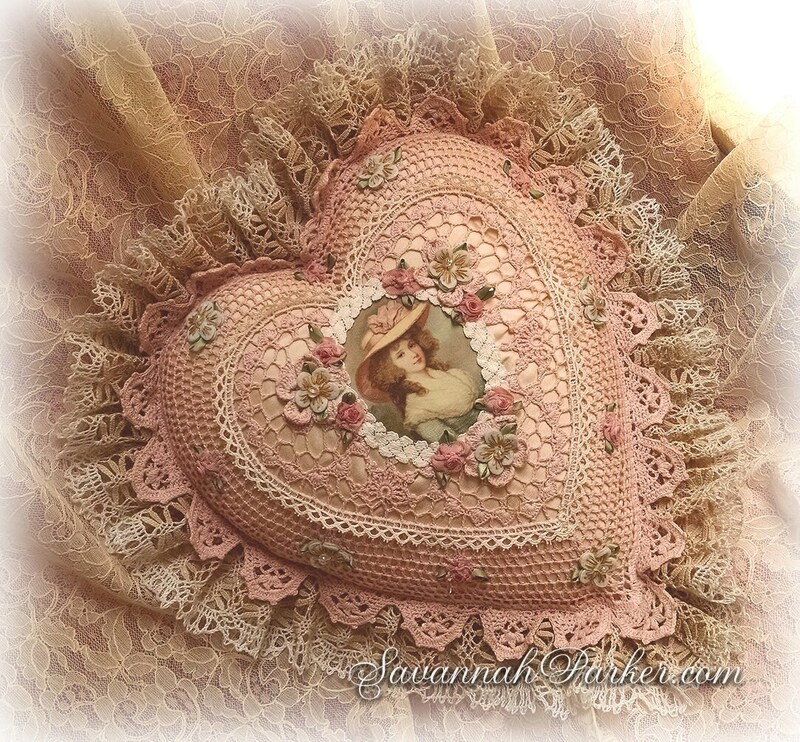 A beautiful, plump pillow that will be the focal point of a wonderful antique style room/bedroom/boudoir...the perfect accent for a lavish bed or an elegant sofa/chair or chaise. 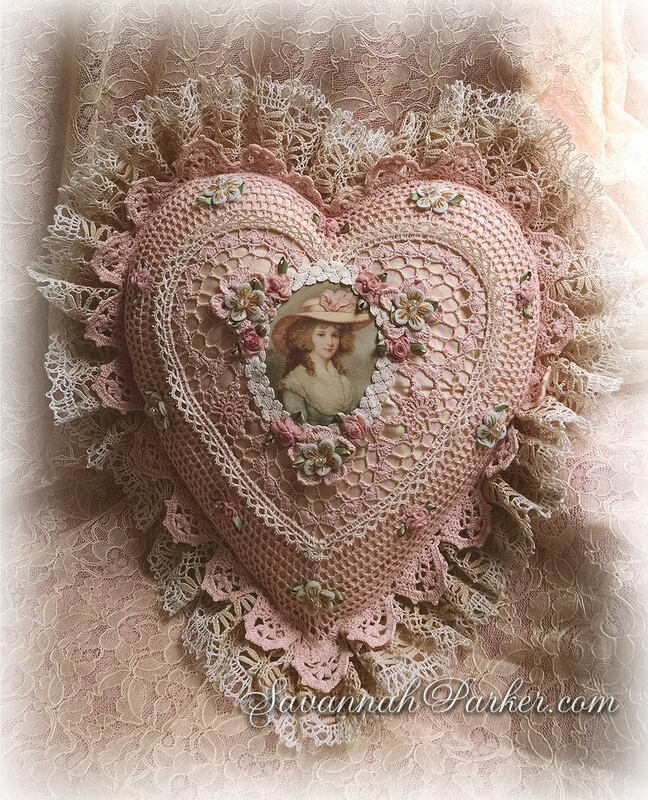 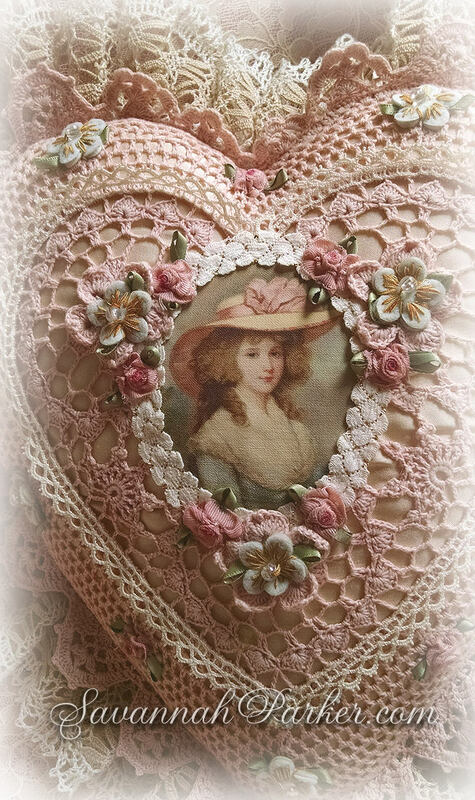 This incredible piece was inspired by my love of antique fashions and decor as well as the dainty pink and cream color scheme of classic cottage/shabby chic...This exquisite totally handmade, sweetly heart shaped pillow is a nice dainty size and has several types of delicate detailed trims that I've handsewn on..the hand crocheted blush pink lacy front features handmade ribbonwork rosette flowers & leaves and antique handmade lace; in the center is a gorgeous vintage-style print on fine cotton of a beautiful Gainsborough-era lady in an elaborate hat....she is surrounded by exquisite pink ribbonwork flowers and soft felted, hand embroidered and beaded palest blue ones; circling this centerpiece is some fab vintage ivory braid trim with the most delicate, tiny metallic threads woven into the design that gives the most refined little hint and glint of gold....dotting the outer border of the pillow are more of the ribbonwork pink flowers and pale blue beaded felt flowers, alternating around the pillow. 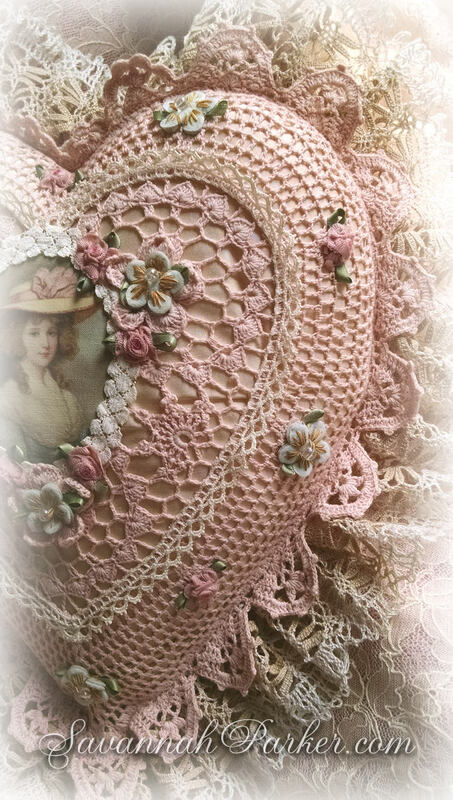 The edge is finished with a wide, full ruffle of gorgeous antique lace, peeking out from under the attached pink crocheted scalloped border. 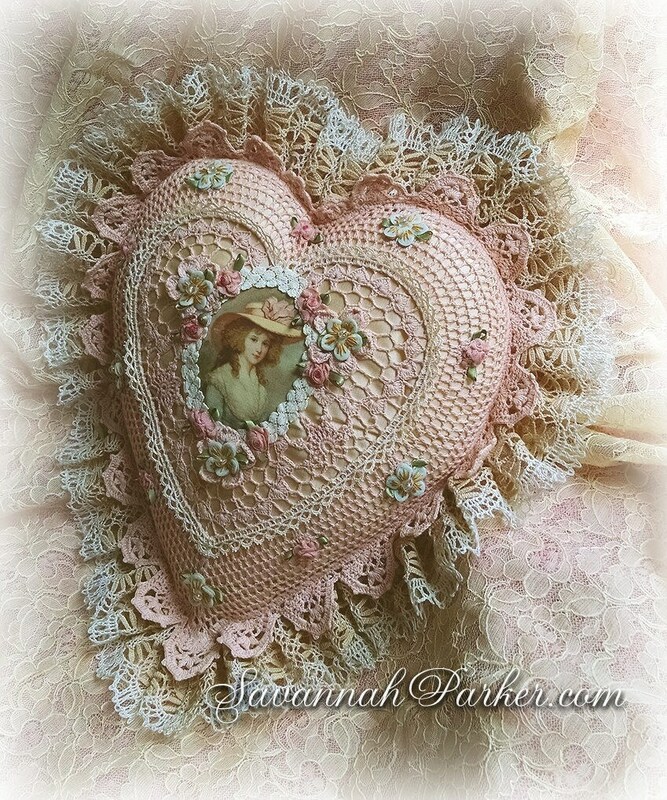 The base of the pillow is soft ivory silk and fine pink silk bengaline, which I custom tailored and created in a matching heart shape to fit exactly--it is firmly filled with a nicely plump batting. 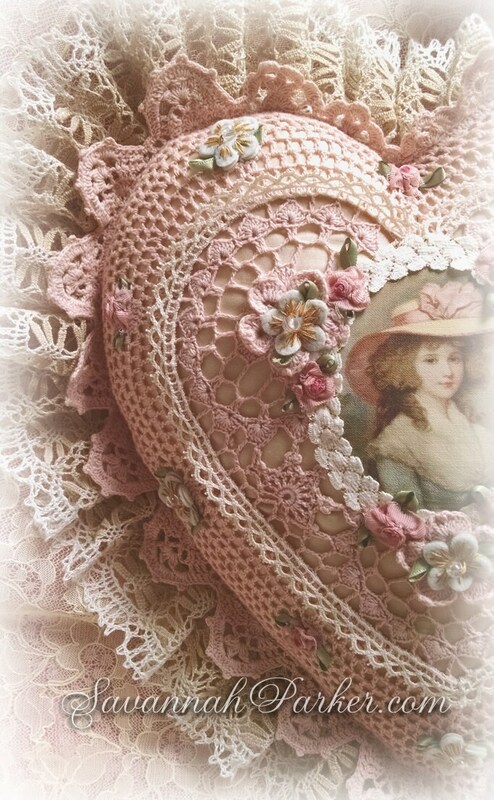 All elements of this pillow are very meticulously sewn; NO gluing whatsoever....all of the laces and added elements are HAND SEWN on to the pillow, not done by machine--strictly old-school craftsmanship.